You can see three of my Franklin Christoph pens in my Franklin Christoph Penvelope 6 pen pouch below. 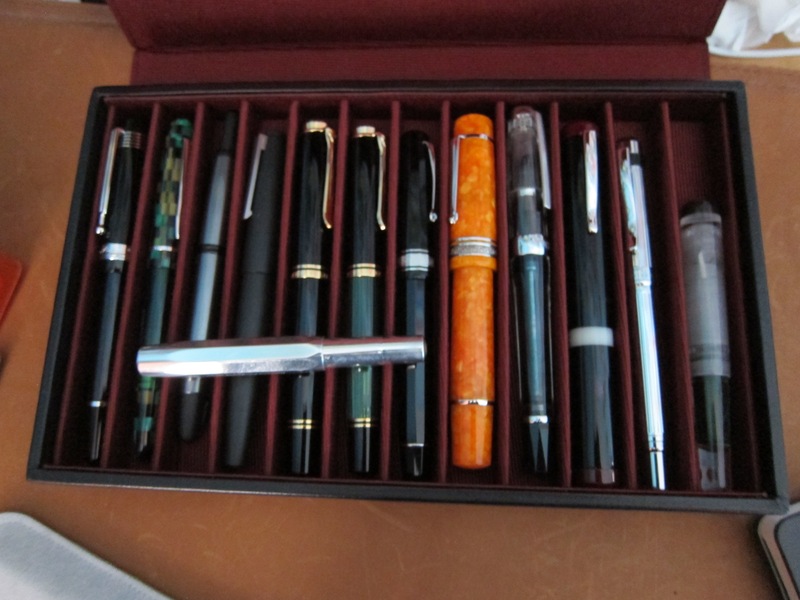 They are…FC Pocket 40 Smoke and Ice- laying across the top and filled with Iroshizuku Chiku-rin, the FC Collegia- 4th from left in silver and next to that my FC 33 Abditus. This is an interesting fountain pen and won a number of awards for its unique “hidden” design. For more information please visit http://www.franklin-christoph.com. Even if you are outside of the USA, FC deliver for free internationally and goods have always come to me super fast and packaged nicely. I like the smoke and ice material of the Pocket 40 in particular, and looks great used as an eyedropper as I have below. The Pocket 66 long fountain pen is even more appealing in this finish, and if you used it as an eye- dropper you would probably never need to fill it with ink ever again. Franklin Christoph are also great for accessories, and in addition to this Penvelope 6 in boot leather brown, I also bought a very classy 12 pen tray in faux black leather, pictured below.